Rare Clarence S. Campbell Bowl award, won by the Edmonton Oilers during their 1987-88 season. The Campbell Bowl trophy is awarded to the NHL's top team in the Western Conference, before the Stanley Cup championship. Trophy was presented to Edmonton Oilers physical therapist Juergen Merz, whose name is engraved upon the trophy along with that of his team ''Edmonton Oilers'', who won the Stanley Cup that year in a sweep against the Boston Bruins. 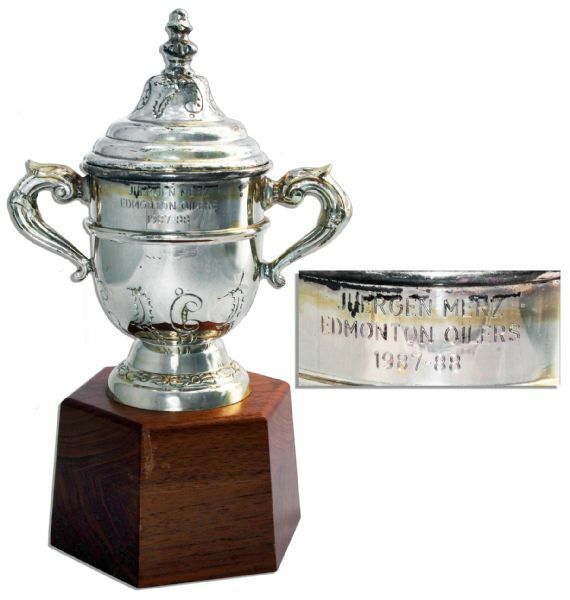 Trophy is a metal double-handled lidded cup mounted to a hexagonal wooden base, engraved ''CLARENCE S. CAMPBELL BOWL / 1968'' and ''Juergen Merz / Edmonton Oilers / 1987-88''. Measures 8.5'' in height and 4.75'' across the bottom of the base. Affixed to felt backing is the sticker of manufacturer ''Boffey of Montreal''. Some tarnishing, else near fine.